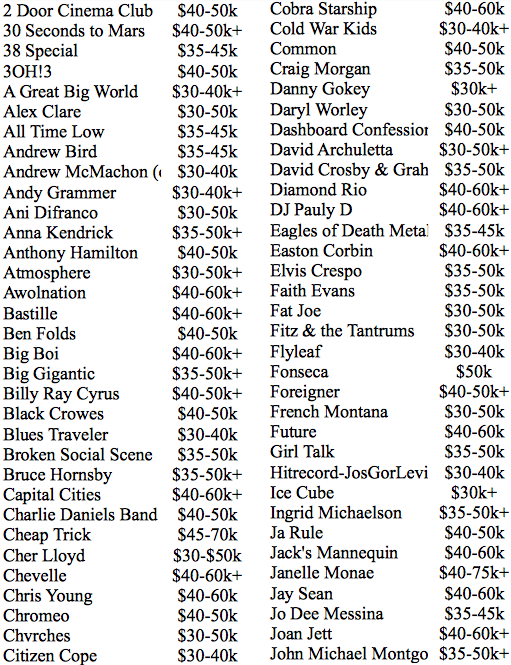 How Much Does It Cost to Book Your Favorite Band? 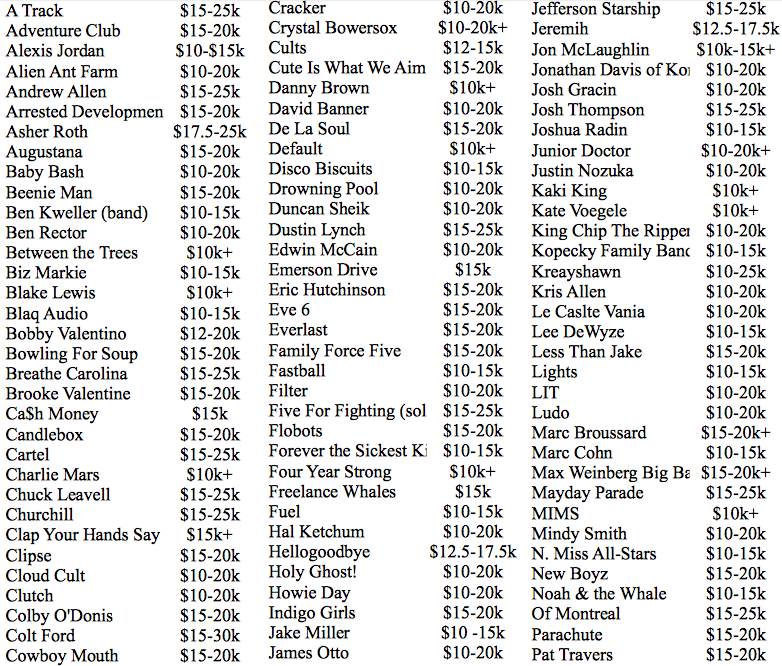 Ever wonder how much it costs to book your favorite band? 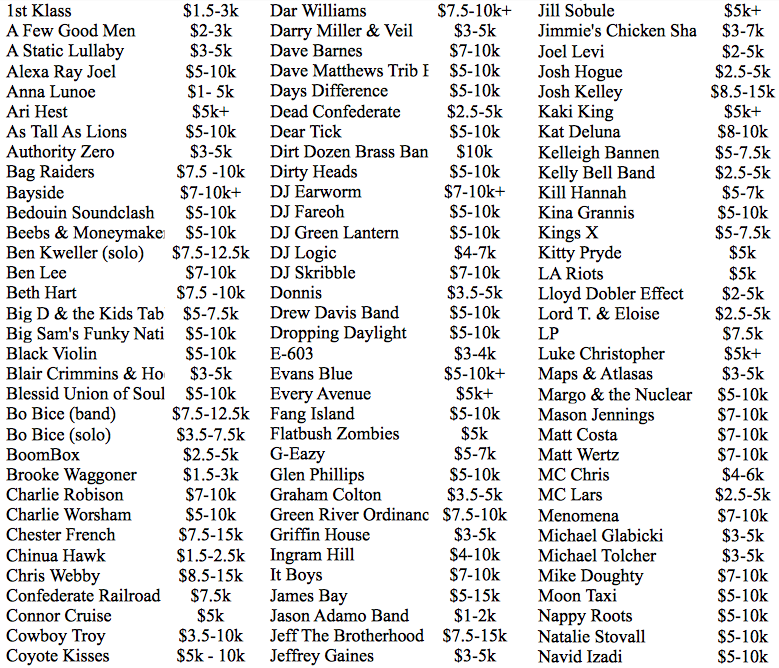 Thanks to Degy Entertainment, a booking agency, we can give you a rough idea: an anonymous source passed along a list of the rates suggested by the artists' agents per show, pre-expense. Before you read these lists, a few things should be clarified. First of all, they aren't perfect: a few acts are out of place, or suspiciously off -- we'll try to address these below. You'll also notice that there are a few anomalies, and acts that aren't music-related (i.e. Myth Busters, who you can rent for a mere $100k); Degy books speakers and corporate entertainment acts too, and a few slipped into these listings. Lastly, keep in mind that these lists aren't comprehensive. 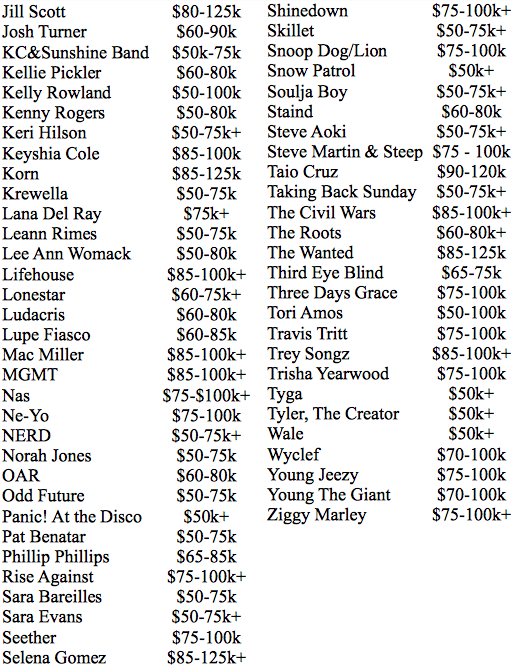 Below, we've organized the artists by purported booking fees from highest ($100k+) to lowest ($1,000). 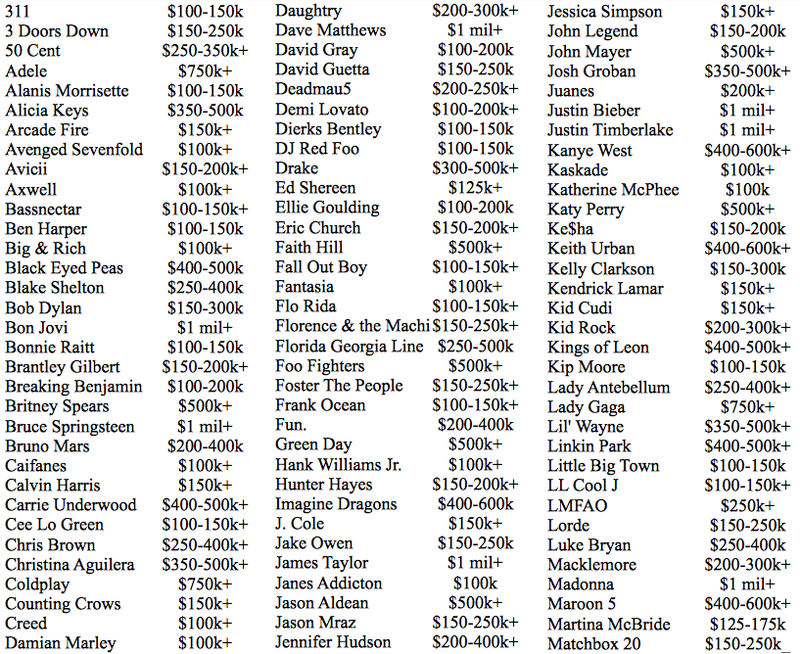 According to this list, a total of eight Degy acts command more than $1 million per show: Taylor Swift, Madonna, Justin Timberlake, Justin Bieber, James Taylor, Dave Matthews, Bruce Springsteen, and Bon Jovi. 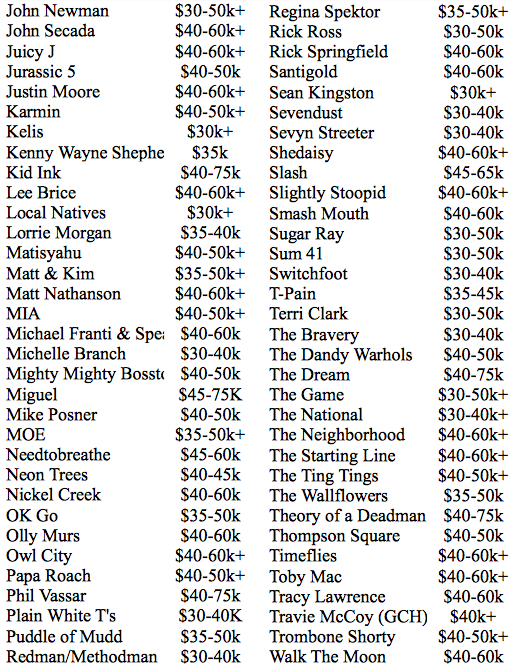 Surprisingly, half of these artists are over the age of 45. But a few things seem strange here. Lady Gaga, who was 2013's second highest-grossing act (trailing only Madonna), almost certainly commands over $1 million per show, as opposed to the $750k figure reported here. 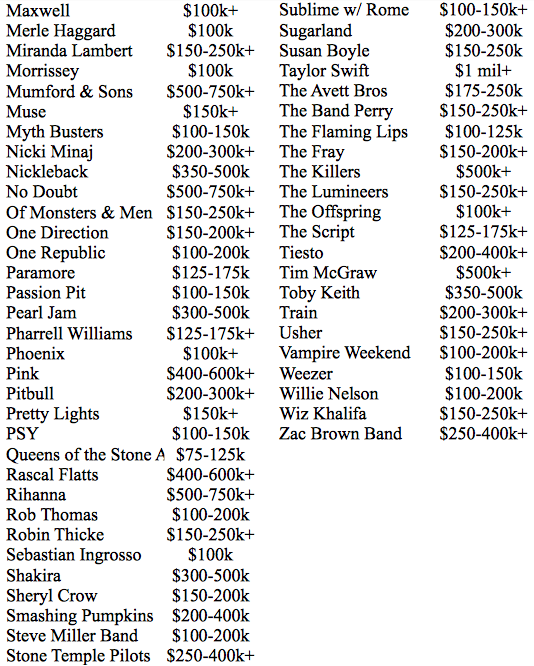 One Direction, Britain's most successful boy band of all time, also seems suspiciously low, listed here at "$150-200k+" per show. Another booking site suggests numbers nearly three times higher -- $500,000-$1 million per show -- which seems more realistic, considering the band's tremendous explosion in popularity. We realize B.B. King is getting old, but $75-100k for one of the greatest blues artists of all-time is certainly low. 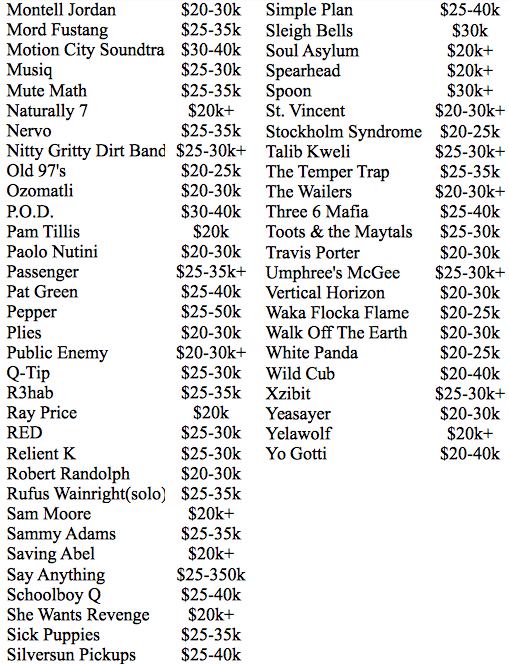 Rival booking agency CTI lists the 88-year-old guitar guru at $250-500k per performance, which seems more accurate. It also saddens us that Selena Gomez purportedly makes more than double per show than Credence Clearwater Revisited (though only a few original members remain). 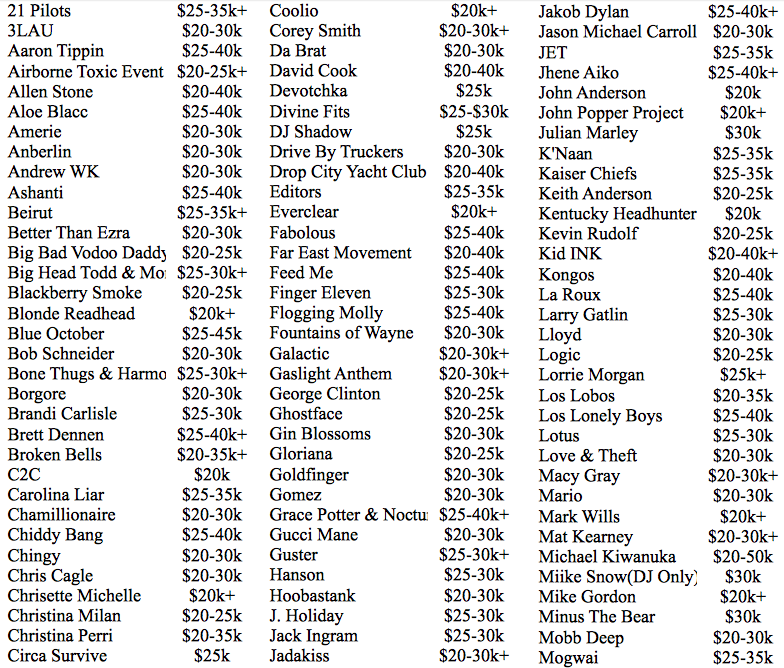 The first thing that stuck out to us in this list was Ice Cube's $30k rental rate. Certainly, the man who Snoop Dogg once proclaimed "the greatest MC of all time" must command more than that! The figure listed for him here may actually be his fee for speaking engagements (not rapping); another booking site clarifies that his "social issues and leadership" talks come with a $30k-50k price tag. 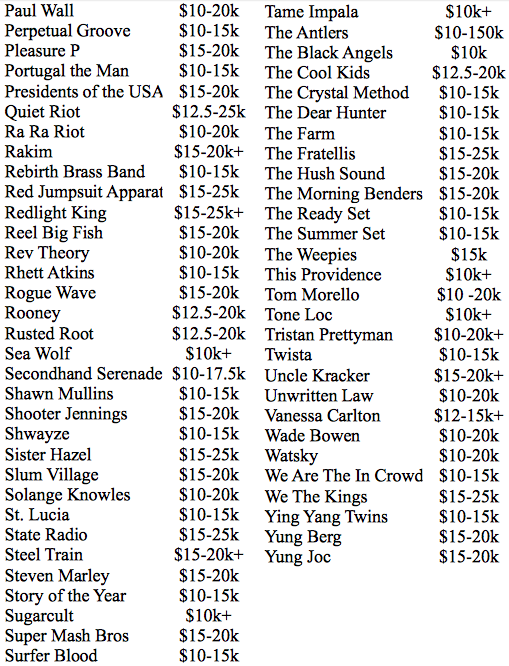 We also couldn't help but notice the abundance of big '90s bands in this category -- Smash Mouth, Sugar Ray, Ben Folds, The Wallflowers -- and wonder how these rates would compare to what these artists made in their prime. Coolio -- performer of the immortal "Gangsta's Paradise" -- has slipped off the radar a bit over the past decade. The Grammy-winning, multi-platinum artist commands only $10-20k per show these days, according to CTI (consistent with what's posted here). Solange Knowles, at $10-20k per show, costs about 1/100th of what her sister, Beyonce, does. 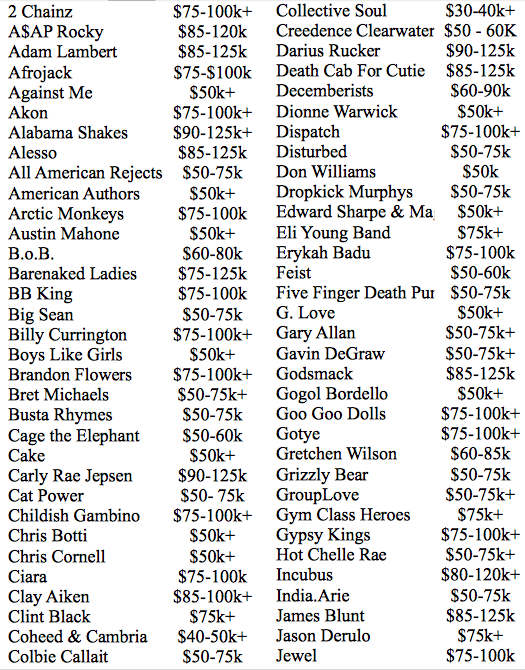 It's also nice to see that Biz Markie ($10-15k) still going strong (we didn't even know he was still alive). 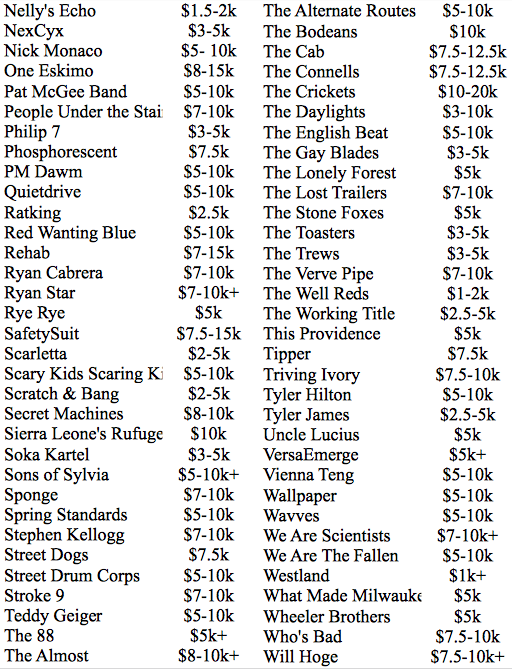 We're not cool enough to know too many of the bands in this last category, but "Nelly's Echo" sounds promising at a $1,500 price point (Priceonomics holiday party 2014, here we come). In any case, reviewing these lists clarifies at least one suspicion: there seems to be no correlation between booking fees and talent. Zachary Crockett is a writer for Priceonomics, where this post first appeared.